The setup() method: This method is called once when the sketch is started (whenever the device is powered on or when reset button is pushed ).It is used for setup and initialization. Here two constants are defined (using the preprocessor directive #define). One of them defines the message which will be displayed at startup and the other defines the effective frequency that the loop() method will run at. Defining constants in this way allows for easy modification of these values. This is particularly true in cases where the constants are referenced multiple times throughout a sketch. We also declare a global variable , loopCount of type int and initialize it to 0. 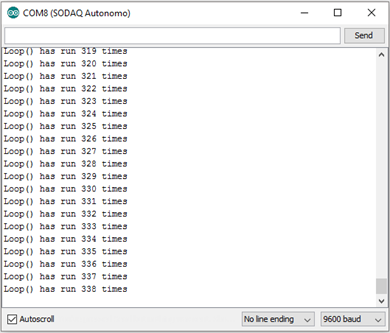 Here we first open the serial connection using the method SerialUSB.begin().We then send a message to the serial monitor using the SerialUSB.println() method, passing it the string constant START_MSG as we defined above. Here we increment the value stored in loopCount using the ‘++’ operator. 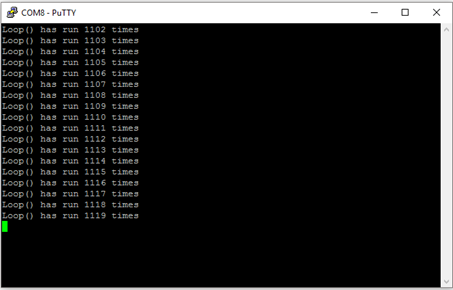 We then display a message which shows how many times the loop() method has been called so far. Finally we call the delay() method which only returns after the specified number of milliseconds have elapsed. This effectively controls the execution frequency of the loop() method. We use SerialUSB instead of Serial for communication with the serial monitor (or any other terminal emulation software as PUTTY for example). Re-opening the serial monitor doesn’t reset board. However if you reset the board from the reset button on the board, you must re-open the serial monitor. Once the sketch is uploaded it will start executing. This means you may miss any initial messages sent to the serial monitor. We can avoid this using wait function until the serial monitor is opened. However, this while loop in setup method has a drawback that it will stop the sketch from proceeding unless the SerialUSB connection is opened, which will not be practical if we are using an external battery to power Autonomo. Modifying the while loop function by adding a timeout will be the idle way to handle that situation. Now we can see the loop counting from the beginning on our previous code.